Celery is a mild-flavored, green, tube-like, stalk vegetable that is valuable in making stocks, stews, soups and sauces. It is also excellent in raw salads or on it's own with dip. Celery also has medicinal properties, acting as a diurectic and stimulating proper bladder and kidney function. It is also believed to be helpful in treating ailments such as arthritis, asthma and bronchitis. Choosing: Look for celery that have firm and healthy stalks and leaves. Procuring: Celery is available all year round. Harvesting occurs when the average size of celery in a field is marketable; due to extremely uniform crop growth, fields are harvested only once. Celery is used in weight-loss diets, where it provides low-calorie dietary fibre bulk. Celery contains androstenone. Celery seeds are also a great source of calcium, and are regarded as a good alternative to animal products. 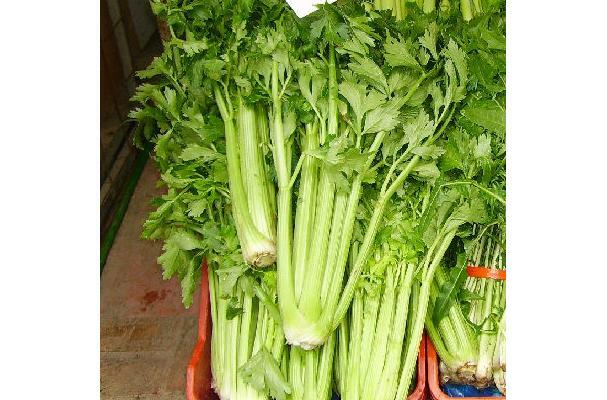 Cleaning: Petioles and leaves are removed and harvested celery are packed by size and quality (determined by color, shape, straightness and thickness of petiole, stalk and midrib length and absence of disease, cracks, splits, insect damage and rot). Store celery in a perforated bag in the vegetable drawer in your fridge. Until you're ready to use your celery, leave the stalks attached to the base to retain it's freshness. Under optimal conditions, celery can be stored for up to seven weeks between 0 to 2 °C (32 to 36 °F). Inner stalks may continue growing if kept at temperatures above 0 °C (32 °F). Freshly cut petioles of celery are prone to decay, which can be prevented or reduced through the use of sharp blades during processing, gentle handling, and proper sanitation. When wrapped in aluminum foil, the stalk will stay fresh for several weeks. In classical Greece celery leaves were used as garlands for the dead, and the wreaths of the winners at the Isthmian Games were first made of celery before being replaced by crowns made of pine. According to Pliny the Elder in Achaea the garland worn by the winners of the sacred Nemean Games was also made of celery. History: Daniel Zohary and Maria Hopf note that celery leaves and inflorescences were part of the garlands found in the tomb of pharaoh Tutankhamun (died 1323 BC), and celery mericarps dated to the 7th century BC were recovered in the Heraion of Samos. However, they note "since A. graveolens grows wild in these areas it is hard to decide whether these remains represent wild or cultivated forms." Only by classical times is it certain that celery was cultivated.